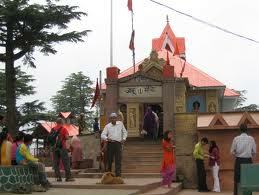 Here is Some Information about Jhakhu Temple in Shimla Himachal Pradesh india. Temple Timing: 7:00 am to 8:00 pm. 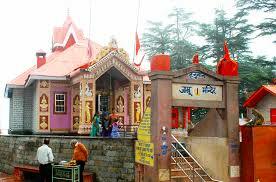 Jhakhu temple of lord Hanumanji is situated at the height of about 8500 ft. in the east of historical ridge ground in Shimla city. 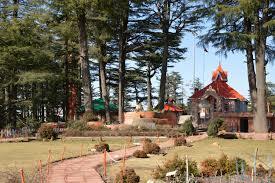 This temple is very easily approachable and is one of the most sought after site to be visited not only by the devotees and pilgrims but also by the tourists of all age groups visiting Shimla, the Hill capital of Himachal Pradesh. The temple has an interesting legend behind it. It is said that a deadly arrow injured Lord Rama's brother Lakshmana when he was fighting the battle with the demon king Ravana. A priest diagnosed Lakshmana and said that he needed a particular Sanjeevani herb from the Himalayas to cure Lakshmana. Hanuman was sent to get that herb from he lofty mountains. Upon reaching the Himalayas, Hanuman couldn't make out as to which herb was the Sanjeevani. So he dug up the entire mountain and flew back to where Lakshmana was lying injured. 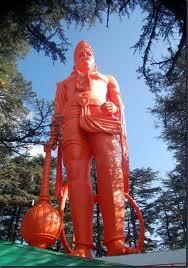 After Lakshmana was cured, Hanuman went back to place the mountain in its original site. He rested on top of the Jakhu hill for sometime. It is said that the top of the hill got flattened due to Hanuman's weight! The temple has been built around the place that is supposed to have the footprints of Hanuman. 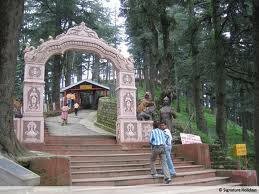 It is a highly revered religious place of Shimla and devotees throng in huge numbers to pray. The shrine is a hotspot for monkeys who flock here in great numbers and generously accept eatables that are given to them by devotees and tourists. One of the main attractions in Shimla is the Jakhu Temple or as it is locally known, the Hanuman Mandir, which is located at Jakhu Hill. The Jakhu Hill is 2 km from the Ridge and at a height of 2500 m is the highest peak in Shimla and offers a beautiful view of the town and of the surrounding Himalaya mountains. The main deity of worship at the temple is Lord Hanuman This temple of Lord Hanuman was constructed by the sage Yaaku in remembrance of lord Hanuman. 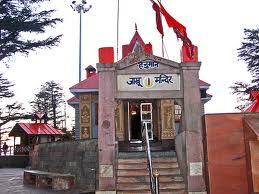 The Jakhu temple is one of the most mythologically relevant places in Shimla. 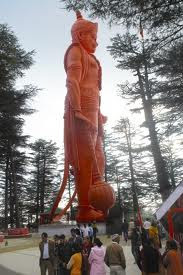 Even before you begin the steep climb of 300 mts you can see, a 108ft high orange Lord Hanuman statue standing out majestically from behind the deodar trees. 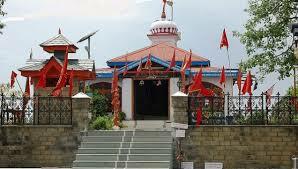 The temple holds several statues and paintings of Lord Hanuman as well as Lord Rama. 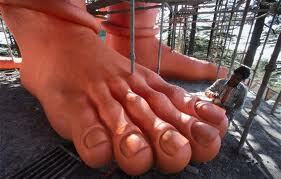 The temple also has a pair of feet engraved in white marble which devotees believe are of Lord Hanuman. Throughout the day One can hear the ringing bells and devotional music throughout the day here and this add to the divinity of the place. The festival of Dussehra is celebrated at the temple with much aplomb this is one of the best times to visit this holy place. By Road : The Himachal Pradesh Road Transport Corporation offers regular bus services to Shimla from various cities like Delhi, Chandigarh and Kalka. By Air : The Shimla airport is 25 km away from the city centre and is served by regular flights from Delhi. 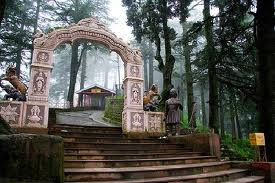 One can hire a taxi from the airport to reach Shimla.